From Charlotte to Tulsa to Baton Rouge, the killing of blacks at the hands of police has sparked outrage and protests in several cities across the country. The fatal shooting of a black man in El Cajon, California, by a police officer Tuesday afternoon is just the latest example. The killing sparked protests outside police headquarters in the San Diego suburb. 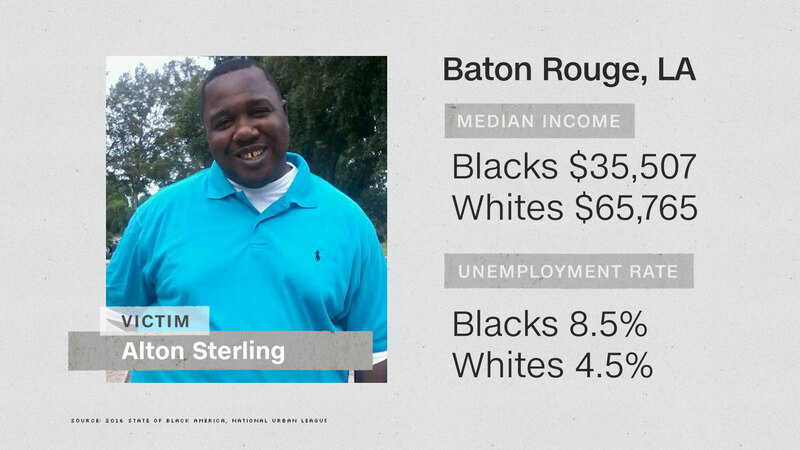 Underpinning the unrest in cities like these are deep economic and racial inequities between black and white residents. "These cities have been very slow to rebound from the recession," said Marc Morial, president of the National Urban League. "You've got a generation of young people who have grown up and whose reality is a recession and in Black America and Inner City America, it's a depression." In the San Diego metro area, for example, unemployment among blacks was 13.7% in 2015, more than twice the rate it was for whites, according to data from the National Urban League's 2016 State of Black America report. The report found that the San Diego/Carlsbad area, however, lands in the middle of the pack when it comes to income inequality among whites and blacks in America's 70 largest cities. Two other metro areas where shootings have occurred, Milwaukee and St. Paul, Minnesota, have the biggest inequality gaps in the nation, according to the report. 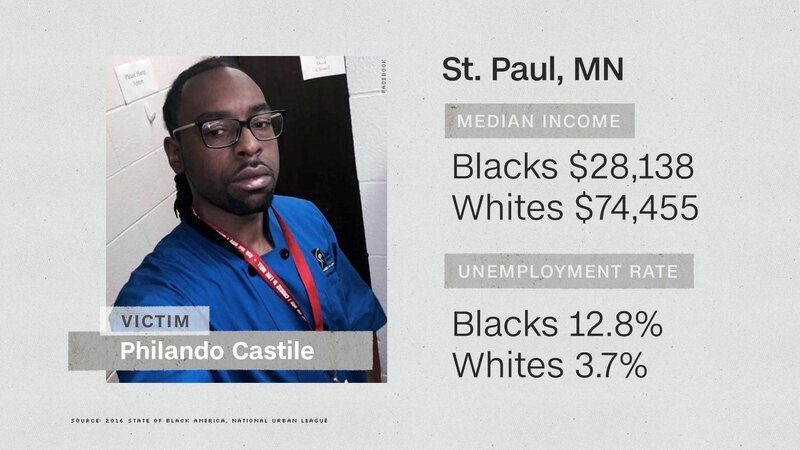 Philando Castile was killed in a suburb of St. Paul where the median income for blacks is $28,138 -- almost one-third the $74,455 median income of whites. 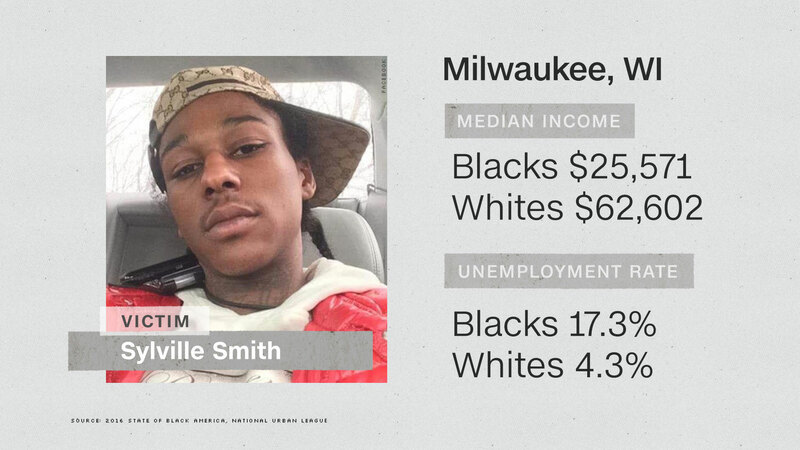 And in Milwaukee, where the shooting of Sylville Smith sparked two nights of violent protests, 17% of blacks are unemployed compared to just 4% of whites. Here's a look at five of the cities where high-profile killings have occurred in recent months and the financial divide between black and white residents. 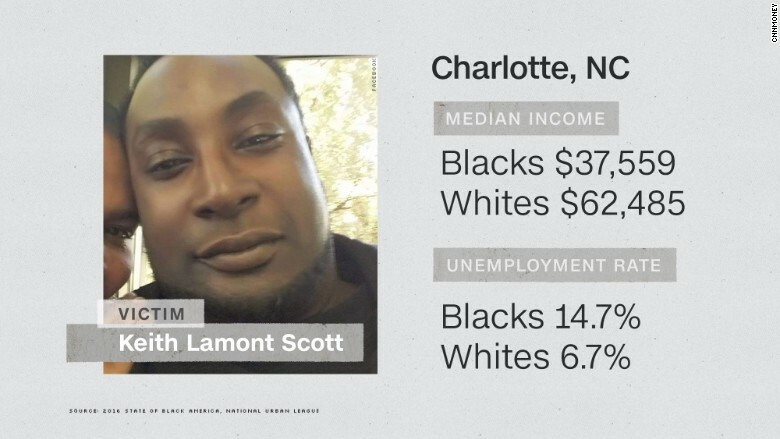 Keith Lamont Scott was killed on September 20th in Charlotte, North Carolina. According to his family, the 43-year old was waiting in his truck for his son's elementary school bus to arrive when he was confronted by police officers who were looking for someone with an outstanding warrant. Police say Scott was armed and refused to drop his gun after being ordered to do so -- an explanation his family disputes. Minutes later, Scott was dead. His killing sparked days of sometimes violent protests between residents and police. One person was killed. Governor Pat McCrory called for a state of emergency and National Guard troops were brought in to quell tensions. The investigation into Scott's death is ongoing. While Charlotte is a major economic hub for North Carolina, "racial and economic divides attest to the reality that Charlotte's enviable growth is not widely shared," a report by the University of North Carolina recently found. Blacks in this city lag far behind whites in home ownership, degree attainment and other economic indicators, the report found. "Charlotte is one of these cities that people like to put up as a version of a new South, but the new South is still a problem when you talk about racial inequality," said Mark Anthony Neal a professor of African and African-American studies at Duke University, who cited issues such as redlining and income inequality. "The black middle class is telling their children they need to be compliant and they still get killed." 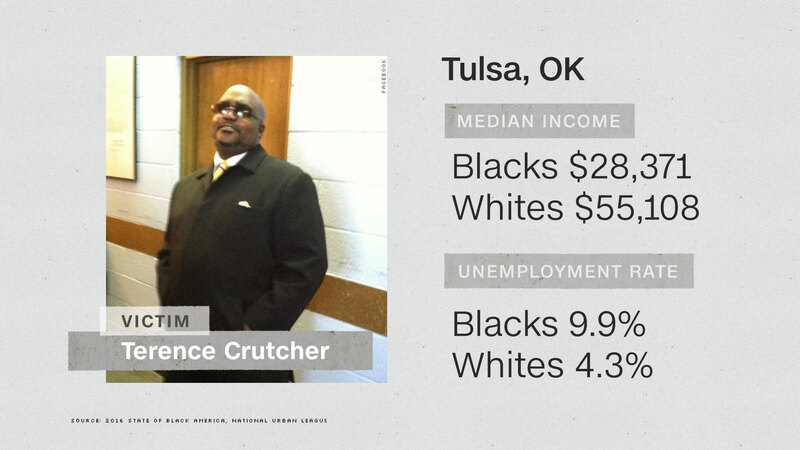 Terence Crutcher was killed on September 16th in Tulsa, Oklahoma. Videos show Crutcher, 40, next to a stalled car in the middle of the road, his hands in the air as police approach him. Moments later, Crutcher falls to the ground, having just been shot. A few days later, Tulsa police released video of the shooting and confirmed that Crutcher did not have a weapon in his car. Officer Betty Shelby, who fired the fatal shot, has been charged with manslaughter and the U.S. Department of Justice is investigating the shooting. While Tulsa residents were largely peaceful in the aftermath of Crutcher's death, the city has never fully recovered from its racial and economic past, said DeVon Douglass, an economic policy analyst at The Oklahoma Policy Institute. In the early 1900s, the Greenwood neighborhood in Tulsa was home to a thriving and wealthy black community, earning the name "Black Wall Street." In 1921, white mobs raided the area and burned most of the community to the ground. Since then, blacks have struggled to regain economic footing. "Generations of wealth were lost," Douglass said. Today, Oklahoma's minimum wage remains stagnant, something that disproportionally affects black and Latino low wage workers, Douglass said. And many professional blacks end up leaving the state because of "overt and covert racism," Douglass said. "I'm sure Tulsa 2016 is different from Tulsa 1921 - I'm very sure of it - but there's still an undercurrent." Sylville Smith was killed on August 13th. Smith, 23, and another man were pulled over by police that afternoon and fled on foot. Police said they shot Smith after he refused to put his gun down. According to police, Smith was also carrying multiple rounds of stolen ammunition. Smith's death prompted three days of riots. The Wisconsin Department of Justice is investigating the case. After Smith was killed, the city's Alderman Khalif Rainey said Milwaukee had become "the worst place to live for African-Americans in the entire country." The racial and economic disparities in Milwaukee have been some of the worst in the country for the past 30 to 40 years. Marc Levine, a public policy professor at the University of Wisconsin, Milwaukee said black wealth was sustained in the 1970s by manufacturing jobs that have since disappeared. Now, Blacks in Milwaukee tend to live in areas of concentrated poverty, they are more likely to be pulled over by police and have been incarcerated than whites. Philando Castile was killed on July 6th in Falcon Heights, a suburb of St. Paul, Minnesota. Castile and his girlfriend Diamond Reynolds were pulled over for a broken taillight. Reynolds' four-year-old daughter was in the back seat. According to Reynolds, Castile, 32, told the officer he had a firearm and was reaching for his wallet when the officer shot him four times. Reynolds then took to Facebook to stream what was happening as Castile lay dying, blood soaking his white shirt. Castile's death sparked days of protests. The U.S. Department of Justice has not yet opened a formal investigation into the case. For Myron Orfield, a law professor at the University of Minnesota, the racial and economic tensions in St. Paul and other cities can be explained by increasing racial segregation. In the 1990s, state officials began dismantling school integration programs creating schools that are now "very white, very black, very Latino or very Asian" Orfield said. In addition, fair housing laws have also come under fire as more low-income housing units are being built in poor black communities where residents have less access to jobs and well-performing schools. That segregation has led to an increase in racial profiling by police and "an abuse of police power," Orfield said. "When people don't trust each other, it lights a fuse on a dry tinder box of anger." Alton Sterling was killed on July 5th, just one day before Castile. Sterling, 37, was selling DVDs and CDs outside of a convenience store in a strip mall when he was confronted by police, pinned to the ground and shot. 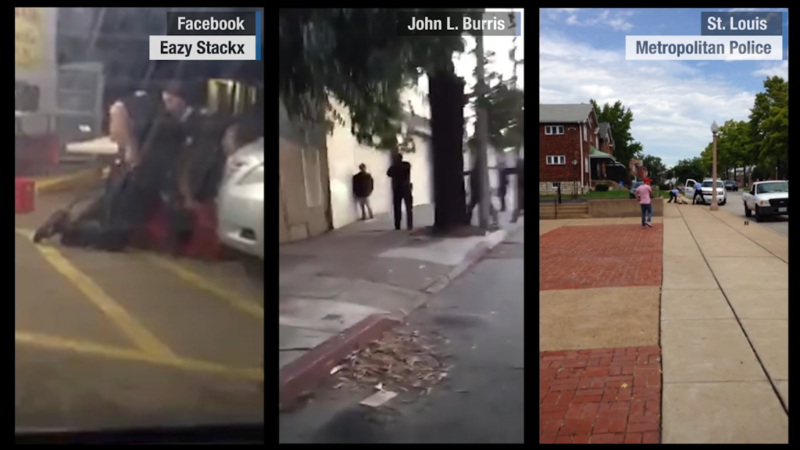 Videos of the shooting went viral on social media and days of protests followed. The Department of Justice is investigating the case. Adam Knapp, the president and chief executive of the Baton Rouge Area Chamber of Commerce said that lack of access to jobs, "white flight" and a historically segregated school system that disproportionally affects poor blacks were partly to blame for economic disparities in the parish. "We got here on a path of decades and decades of systemic challenges in our community that have led to where we are today," Knapp said. In 2003, a federal judge settled a decades old desegregation lawsuit in Baton Rouge and since then, Knapp said, conditions have slowly begun to improve with more investment dollars flowing into the public school system and the arrival of charter schools. Knapp also highlighted efforts by nonprofits in Baton Rouge to better train and prepare adults for work. "If we see disparate access to the benefits in the economy, the solutions [not only] have to be access to jobs in the community but also education," he said.